Great Friday…and a Little Whiskey Business!! Years ago I used to hold an all-women cocktail party for my girlfriends on the Friday following Good Friday. I called it Great Friday. Why? Because while Good Friday is, well, good and all that, Great Friday…is GREAT! I think the last one I hosted was back in 2006. Not sure why I stopped. I was reminiscing about it all last night, and decided it was time for another Great Friday. I believe I may have mentioned I am a Whiskey Girl…I love my bourbon…and sometimes a wee bit of Scotch…and I’m working on developing my taste for Rye Whiskey (it’s coming along nicely, thank you very much!). I decided to keep tonight’s Great Friday small and low-key. 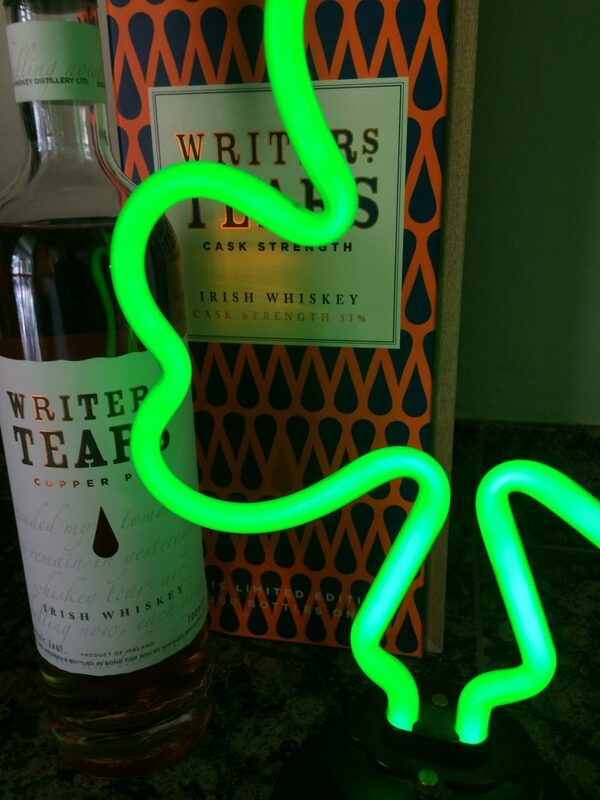 So Instead of fancy cocktails I’m serving up whiskey, specifically the Irish variety. I have a couple of girlfriends who are also whiskey drinkers, and we are gathering tonight to sample several in my collection. One of my last visits to Ireland I found myself in a pub (as all of ye should be when in Ireland! No better place to find yerself…), and that’s where I first discovered this whiskey. For some reason I didn’t bring a bottle back with me to the States. Upon arriving back home I decided I needed to add it to my collection. This was a bit of an issue since it seems it is not sold here, or at least it is not sold near me. But I was determined. And obsessed. After a hearty online search I finally found a distributer in Germany who was able to ship it to me. Tonight I will sit here happily enjoying a wee bit o’ th’ stuff w/ me lassies. Life is good, eh? 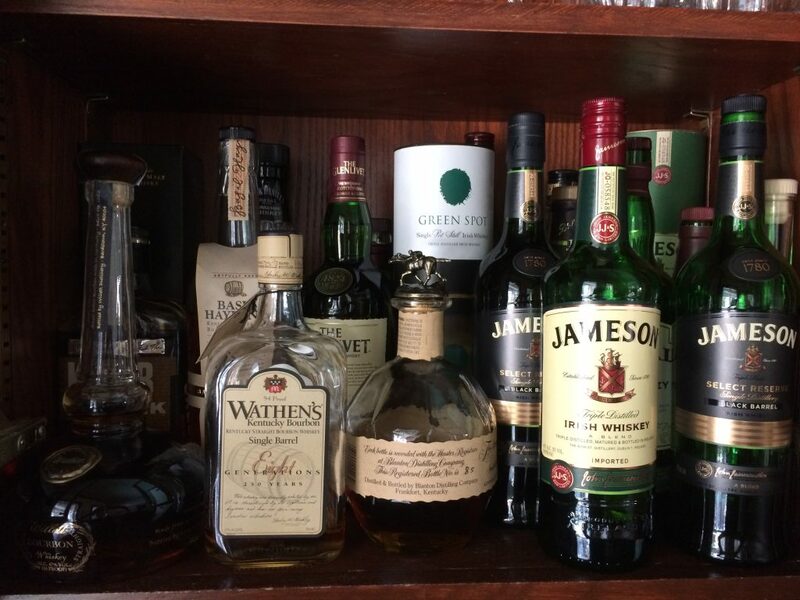 This is not the only Irish Whiskey in my collection. In fact, there are a couple I prefer over this one, namely “Redbreast” and “Green Spot.” I’ve been known to take a nip of either on a chilly night by the fire. Not that I limit myself solely to those times; however, there is something about a crackling fire that seems especially fitting when partaking of a dram (or two) of whiskey. I’m off to prepare for tonight! Slainte (y’all)! I use the internet as a source for many of my recipes, and it often inspires my creations. But there is nothing like holding a [cook] book in hand, scrolling through recipe after recipe and drooling over colorful, well-staged photos, to get me in the mood for cooking. How did I get so MANY?? Yes, I have a lot. More than most I suspect. Some were given to me. Many have been written by favorite chefs, signed if I’ve had the chance to meet them in person (and many I have). 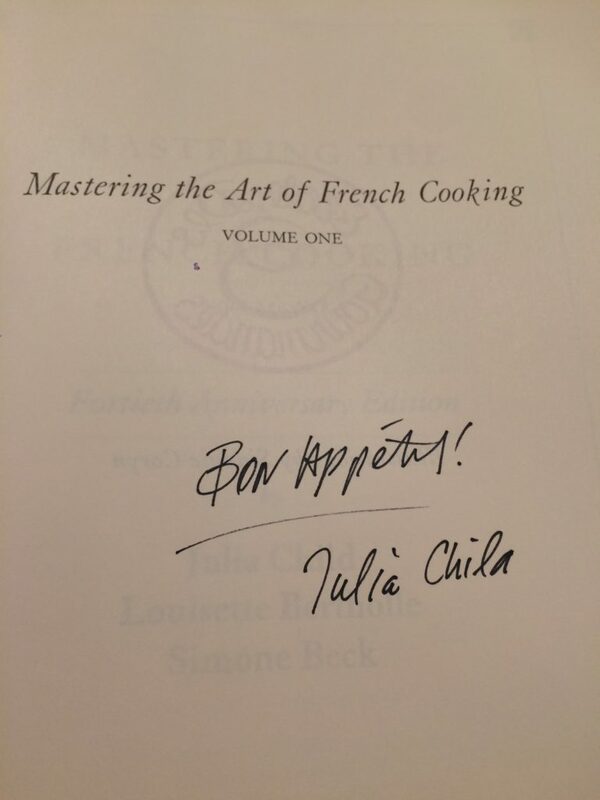 I have a coveted copy of Julia Child’s “Mastering the Art of French Cooking,” autographed shorty before her death in August 2004. And I have several signed books by my favorite local celebrity chef, Stephan Pyles. One of my treasures is this signed edition of “Mastering the Art of French Cooking” by Julia Child. I bought it 2 days before her death. I am honored to have this in my collection. Most of my cookbooks I bought myself. 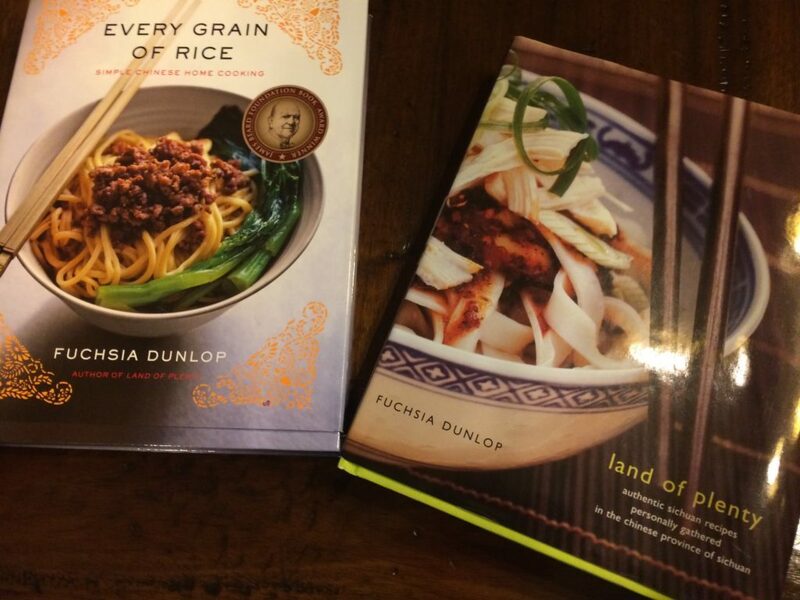 In fact, I recently acquired two new cookbooks so I might, ideally, perfect a dish or two for my new daughter-in-law. She is from China, and it is a goal of mine to offer her a meal that in some way brings her homeland here to her. She has become a loved and treasured addition to our family! Two new editions. 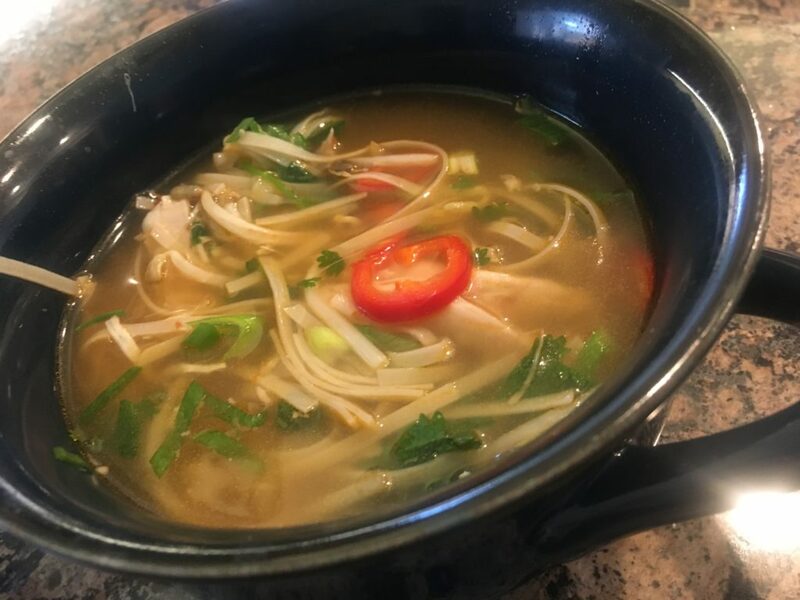 As of this posting I have not yet attempted any of the recipes, but I have read that the author, Fuchsia Dunlop, uses authentic recipes based on her extensive training in China. I hope to recreate a few of these for my daughter-in-law. Admittedly, many of my cookbooks are no more than eye candy that sit idle on my shelf or are rarely opened. 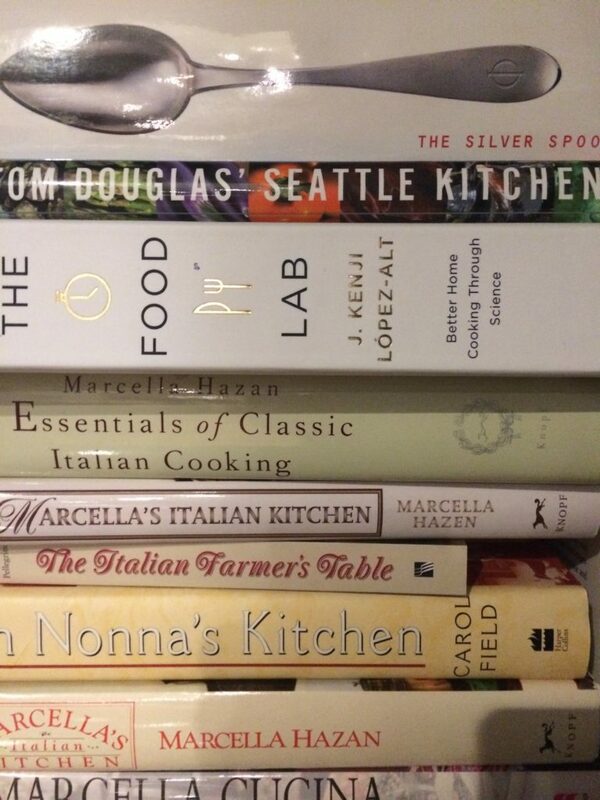 Then there are others I do use on a regular basis, my go-to cookbooks that help me out in a pinch. Rose Levy Beranbaum is one of my cooking idols. 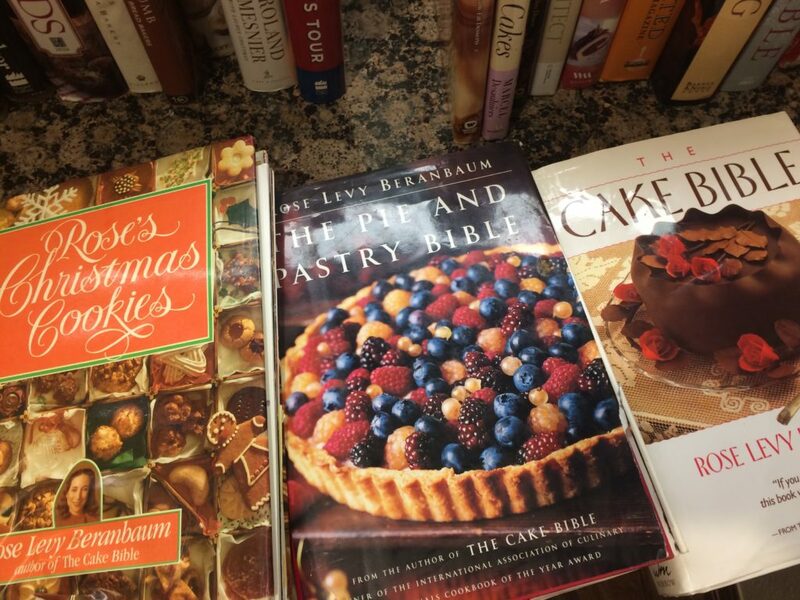 I began with “The Cake Bible” and now own most of her cookbooks (not all in my collection are pictured). The brownie recipe in “Rose’s Christmas Cookies” is my go-to recipe, and is one of my most requested. Amazing! For many of my pies, I use Rose Levy Beranbaum’s “The Pie and Pastry Bible”. I love her books. She takes time to explain not only the “how” of a recipe, but also the “why.” I use a scale to measure ingredients, so I appreciate that she includes measurements both in volume AND weight. 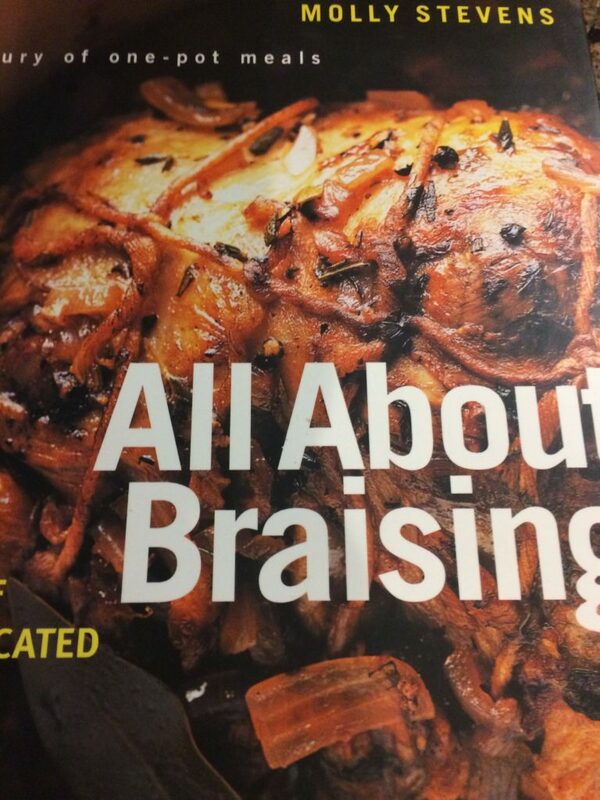 This book in particular details the various crusts you might want to use and with which pies. While the recipes may appear complicated, if you follow carefully they provide a step-by-step method to achieve the best crusts. I highly recommend this book for anyone looking to up their pie-baking skills. Rose’s “The Cake Bible” was on my wish list way back in 1988. I was a mere college student at the time, not yet realizing the depth of my culinary passion. But I should have known from the reaction I had to the cover. I was instantly drawn to its luscious cake draped in a sheet of chocolate(a sheet, I say!) …sigh! Leafing through the bookstore copy had me dreaming of possibilities. I don’t know if I thought I would ever attempt any of the recipes, but they entranced me. Thankfully, I received a copy that Christmas. The pages began falling out from so much use, so I recently acquired a second copy. Of course I don’t only bake. Some of my favorite savory regulars include Molly Stevens’ “All About Braising,” Adam Perry Lang’s “Serious Barbecue,” and Cook’s Illustrated’s “The Best Recipe.” When I was first learning to cook, I found Irma Rombauer’s “Joy of Cooking” to be invaluable. It provides basic information and hundreds of recipes. As my skills expanded and I grew more comfortable, I experimented with modifications to suit our family’s tastes, branching out to more complicated cookbooks and techniques over time. Practice, practice, practice!! I’d like to use more of my collection; therefore, I will pick one cookbook to feature in my kitchen each week. One night that week would be devoted to creating a menu from the chosen cookbook, fulfilling a couple of purposes. One, my cookbooks get more use, collecting food stains and post-it notes to mark favorite recipes rather than merely collecting dust. Two, my repertoire of menu offerings increases as I no doubt branch out into new territory. Sounds like a win-win! *If you click on the highlighted titles in this post they link to where you can buy them on Amazon.com. I get zero (nada, zilch, none) profit from any links. The links are to help you find them should you so desire. “The Silver Spoon” – An Italian book; has a great fresh pasta recipe! This list is a sampling of the more used volumes in my collection. Stay tuned as I work through some of my lesser used cookbooks!! Okay, I’ve shared some of my favorites. What are yours? 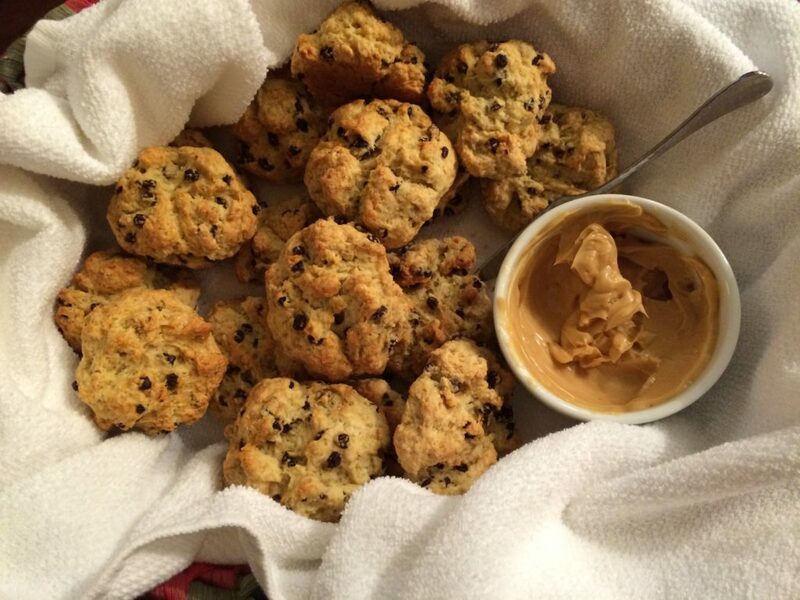 Royal Irish Soda Bread – My Favorite! I look forward to this Irish Soda Bread every St. Patrick’s Day as much as I do my cheesecake and Irish coffee. It is that good. To be fair, it is not authentic Irish Soda Bread. It has butter in it. And a touch of sugar. And raisins. 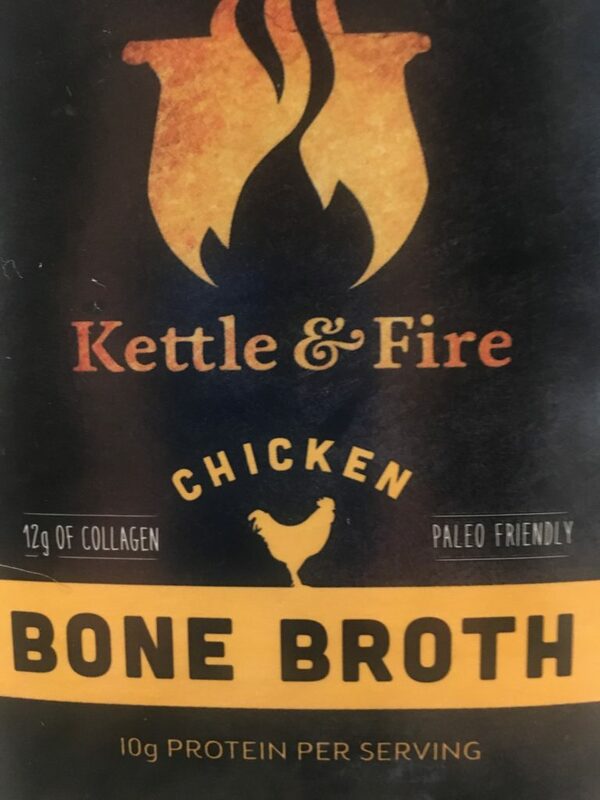 Not something the Irish of old had ready in their pantries back in the day. 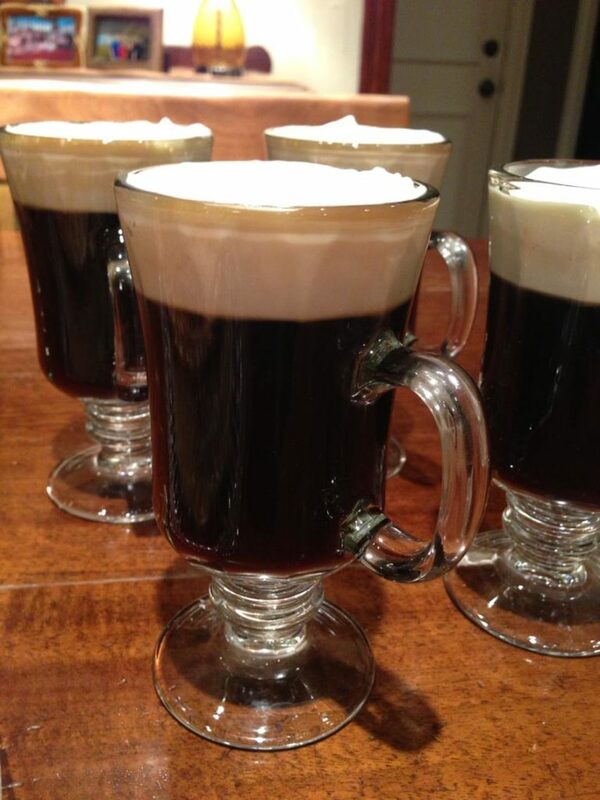 All I need to do tomorrow (which it almost is as I write this…) is to prepare the mashed potatoes to go with the Irish Stew, make sure the Guinness is cold, and if I’m not too tired, make a smoked fish appetizer to start it all off. I did smoke the fish for that earlier today, so we are ready to go! Happy St. Patrick’s to everyone out there. Hope you find the pot of gold at the end of the rainbow before that sneaky little leprechaun gets it first!